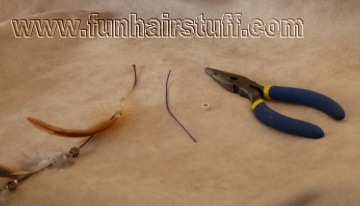 Follow these step by step instructions to fit a feather hair extension using a micro ring. 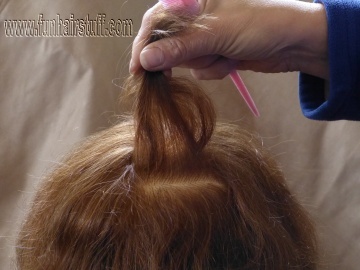 This method works best for fitting feathers or feather hair extensions that have a thin tip. to fit a feather hair extension or single feather with a larger tip you may need to use another method such as thread binding. If you are fitting your feathers to dreads, you may be able to use the clamp beads that you can buy for dreads instead. You will need your feather hair extension, a suitable size micro ring or crimp bead and a pair of pliers with a narrow tip. 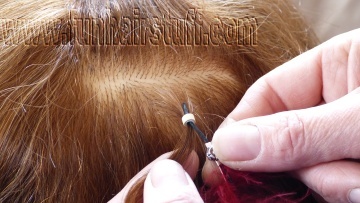 Micro rings and crimp beads are beads that are designed to be squashed flat to hold on to the hair and extension. Micro rings and crimp beads come in a variety of sizes and finishes. 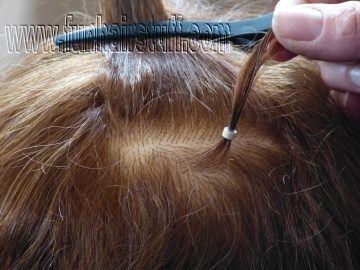 Micro rings made for hair are best to fit a feather hair extension as they are silicone lined and don't damage the hair. They generally come in 4.5mm and 5mm sizes, and a variety of hair colours. Crimp beads are usually silver or gold coloured and meant for jewellery making. It can be difficult to find ones large enough for hair. You will also find a threading tool useful, but you can easily make one with a short piece of wire or thread. 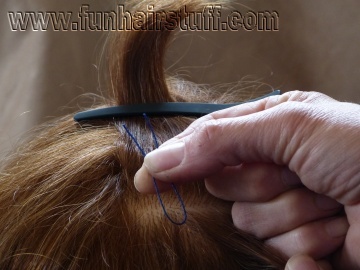 A comb with a long tail can help to get a neat section of hair, and you may like to use a cardboard hair protector clipped to the hair with sectioning clips. It keeps the rest of the hair out of your way. and flip it over the other side. 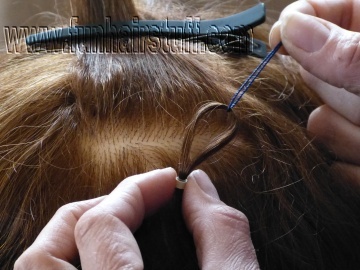 The top of the extension and the micro ring will be placed just under this layer of hair so that it is hidden. 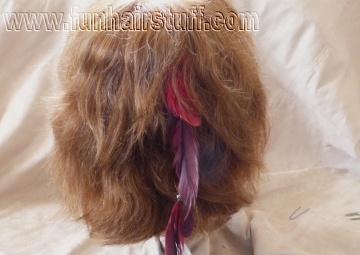 You may instead like to fit a feather hair extension at the lowest part of your hair, for example behind your ear. Clip this hair out of the way. 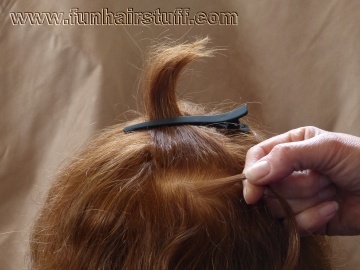 Select a small piece of hair to fit the feather hair extension to. It needs to be small as the hair and the extension have to fit into the micro ring. If you have a threader tool, slide the micro ring onto the tool. Open the hole in the tool and pull the hair through. Now slide the micro ring onto the hair, pull the hair right through the micro ring, and slide the micro ring to the top of the hair. (Not pictured). If you don't have a threader tool, bend your short piece of thread or wire in half. 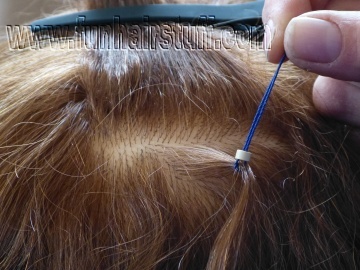 Place the hair into the wire or thread. Now push the wire or thread into the micro ring. 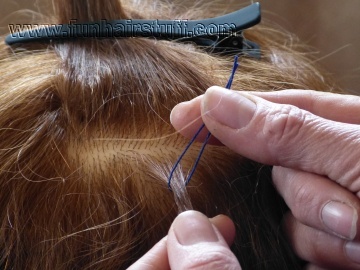 And use the thread or wire to pull the hair right through the micro ring. Slide the micro ring up almost to the top of the hair. 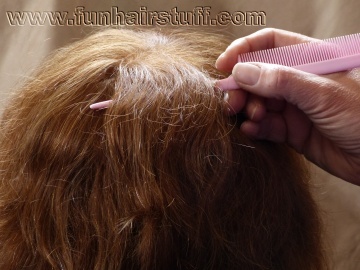 Slide the tip of the feather extension into the micro ring. If it won't fit, you will have to start again with less hair! 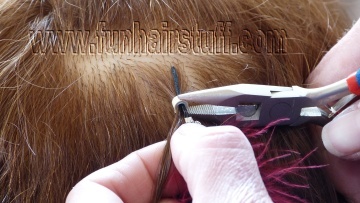 Tip: If you are fitting a feather extension with a waxed cotton tip (like the long ones we sell in our shop) try cutting the tip at an angle with sharp scissors. If it has a thread top, it might help to wet the tip of the thread. If you are fitting a feather hair extension with a stick tip you may be able to carefully trim the tip to make it slightly narrower. If you are fitting a single feather with a large shaft you may need to use another method of attachment such as thread binding. Poke the extension through until you can see a small amount of it sticking out of the top of the micro ring. 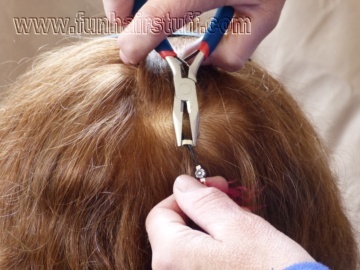 Now use the pliers to firmly squash the micro ring or crimp bead onto the hair and the extension. Give the extension a gentle tug to make sure it is firmly attached. You have now learned how to fit a feather hair extension. 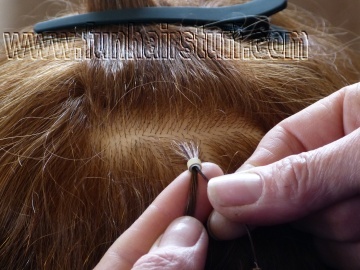 Once the top layer of hair is back in place you won't be able to see the fitting. Using the pliers, carefully squash ends of the micro ring to open it. 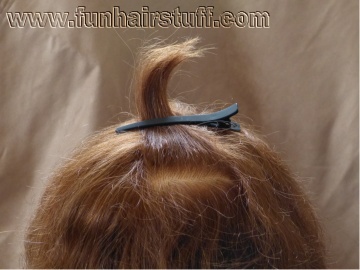 You can now slide the extension and the ring off your hair. If the extension is still in good condition you will be able to reuse it. I promise to use it only to send you Fun Hair Stuff News.